Honorable Mention, Central Ohio Woodturners Members' Exhibition - Franklin Park Conservatory, Columbus OH (9-23-17 to 11-12-17). Article in American Woodturner Journal. Juried - Central Ohio Woodturners Members' Exhibition - Franklin Park Conservatory, Columbus OH (9-23-17 to 11-12-17). Article in American Woodturner Journal. Juried - "Two Grinds, Please" - American Association of Woodturners 2008 Turned for Use II - Gallery5, Richmond VA (6-20-08 to 6-22-08) - Download a catalog. American Association of Woodturners. (2011). Woodturning today: A dramatic evolution (J. Kelsey, Ed., p. 113). Saint Paul MN: Author. 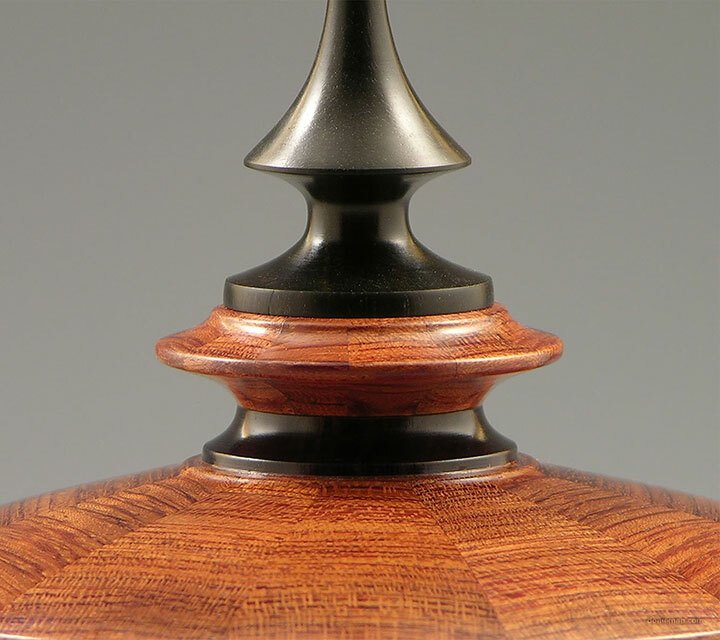 American Association of Woodturners (St. Paul MN) - The international, parent organization of the Central Ohio Woodturners and publisher of American Woodturner journal. Organized in 1986, its membership exceeds 16,000 members (as of 2014). As the largest organization dedicated to the advancement of woodturning, its mission is to provide education, information, and organization to those interested in woodturning. Its annual international symposium is an intensely informative and fun-filled 3 days packed with demonstrations by internationally renowned and local artists, demonstrations and workshops, panel discussions, technical and aesthetic development, safety and legal issues, tradeshow, attendees' instant gallery, and awards banquet. "Turned for Use II" 2008 Annual Symposium Jurors - Alan Lacer (involved with turning for more than 30 years [as of 2008] as a turner, teacher, writer, exhibition coordinator, demonstrator, and past president of the American Association of Woodturners; AAW Lifetime Honorary Member for contributions to the field), Debbie Quick (professor of Craft Material Studies at Virginia Commonwealth University), and Del Stubbs (renowned turner and teacher, especially known for his Scandinavian woodcarving knives). Of the 144 entries submitted for "Turned for Use II," 42 pieces were selected by the jury. Academy of Fine Arts (Lynchburg VA) - 2010 Juror Kathleen A. Edwards is the Chief Curator at the University of Iowa Museum of Art. Edwards has curated more than 30 exhibitions for the UIMA, including "A Legacy of Iowa: Pollock's Mural and Other Masterworks" from the UIMA Collection, "Acting Out: Invented Melodrama and Contemporary Photography," "Eye Witness: Daniel Heyman's Portraits of Iraqi Torture Victims," "I Am: Prints by Elizabeth Cartlett," "Art is Life - Life is Art: The Graphic Work of Dieter Roth," and "From Hayter to Pettibon: American Prints and Printshops." Upcoming projects include the exhibition and catalog Lil Picard and Counterculture New York that will open at GreyArt Gallery (New York University) in April 2010. She is an adjunct professor in the UI department of Cinema and Comparative Literature. Before her tenure at UI Edwards, she was the Executive Director of The Print Center in Philadelphia. Edwards earned a BA at Westhampton College, University of Richmond, and an MA at the Philadelphia College of Art. DHM Digital Gallery - The DHM Digital Gallery was established to promote and celebrate the creativity and value of applied design, which enriches the world around us on a daily basis, but is often underappreciated. While the specific focus of individual gallery exhibits vary, always emphasized is innovation for the purpose of enhancing the sensory, aesthetic component of human interaction with material objects. The Gallery is operated by the Department of Design, Housing and Merchandising (DHM) at Oklahoma State University, a five-campus educational institution with an enrollment of approximately 32,000 students from 115 different nations. The Department of Design, Housing and Merchandising provides graduate and undergraduate education to more than 350 students, including degrees that promote applied design, product development, and entrepreneurial business management. "Art of Applied Design 2010" Juror - June Gilliam Worthington, with degrees focused on Business and Interior Design, has worked with architects, builders, interior designers, landscape architects, technical consultants and artists for more than 35 years to carry out her belief that through creative effort all things are possible. For nearly 20 of those years, she also owned and operated the es Posible Gallery in Scottsdale AZ,specializing in one of a kind art, accessories, and functional art furnishings. The Gallery featured the works of numerous artists and craftspeople in addition to creations by her design associates. June Gilliam Worthington has taught at universities, jurored art shows, and mentored many in search of expressing their creativity. Her clients and customers are from across the United States and many countries abroad. In recognition of this outstanding career in the arts, June Gilliam Worthington is a recipient of the Hall of Fame Award from Oklahoma State University. Dublin Arts Council - The DAC (Dublin OH) engages the community, cultivates creativity, and fosters life-long learning through the arts. Begun in 1983 as an ad hoc committee to bring the Columbus Symphony Orchestra to the dedication of Scioto Park, it has grown to a private nonprofit organization, impacting thousands of individuals yearly through a variety of programs, including community arts and education grants. Ohio Craft Museum - Ohio Designer Craftsmen (ODC, Columbus OH) is a nonprofit organization, founded in 1963, dedicated to promoting awareness and appreciation of fine craft. With more than 2,000 members in 44 states and Canada, ODC, in its 52nd year (as of 2015), is one of the premier craft organizations in the United States. Its mission is to promote the fine crafts aesthetic by establishing a standard of excellence, encouraging creative growth, providing professional support to craft artists, and building public awareness, appreciation, and collection of fine crafts. It receives ongoing funding from the Ohio Arts Council, the Greater Columbus Arts Council, and the Columbus Foundation. "Best of 2016" - Juror Kate Lydon, Director of Exhibitions at the Society for Contemporary Craft, Pittsburgh PA. Lydon reviewed nearly 300 entries, selecting 74 pieces by 54 artists. "Best of 2015" - Juror Beth Ann Gerstein, Executive Director of the Museum of Ceramic Art, Pomona CA. Gerstein reviewed 300 entries, selecting 85 pieces by 56 artists. "Best of 2014" - Jurors Namita Gupta Wiggers, Director and Chief Curator, and Nicole Nathan, Curator of Collections - Museum of Contemporary Craft in Portland OR. They reviewed more than 350 entries, selecting 89 pieces by 74 artists. "Best of 2012" - Juror Lloyd E. Herman is the founding director of the Renwick Gallery of the Smithsonian American Art Museum, where he served from 1971 through his retirement in 1986. He has been touted by the University of Washington Press as "one of the foremost authorities on America's contemporary craft movement." He adopted the directorship of the Cartwright Gallery in Vancouver, British Columbia, in 1998 and planned its future as the Canadian Craft Museum. He has curated numerous exhibitions for the United States Information Agency and the Smithsonian, and for other museums and traveling exhibition services. Herman has lectured on American craft throughout the United States and Australia, New Zealand, Canada, England, Iceland, Hong Kong, Indonesia, India, Pakistan, and Japan and has written several books about fine craft and craft artists. For the past several years, he has led craft tours to Bhutan, India, Iran, Jordan, Morocco, and Vietnam. Herman reviewed 316 entries, selecting 99 pieces. "Best of 2011" Juror - Paula Owens has been the director of the Southwest School of Art in San Antonio TX since 1996. Before this position, she was the director of the Visual Art Center of Richmond VA for more than 10 years. In 1993, she organized the national conference, "Women and the Craft Arts," at the National Museum of Women in the Arts in Washington DC. A printmaker and painter, her work is in public and private collections. Owens reviewed 314 entries, selecting 98 pieces by 67 artists. "Best of 2010" Juror - Albertus Gorman has been a fixture on Kentucky's art scene for more than 30 years. Based in Louisville, he is a veteran of several hundred exhibitions, as an artist, curator, juror, or writer. Gorman is the director of studio arts for the Zoom Group, a program that provides services to individuals with mental and developmental disabilities who wish to further their visual arts skills. He also serves on the Mayor of Louisville's Committee for Art in Public Places. Gorman reviewed 319 entries, selecting 104 pieces by 80 artists. "Best of 2009" Juror - Wendy H. Outland, independent curator & consultant, who administered Florida's public arts program and Capitol Complex Exhibition Program for the Florida Arts Council. In 1991, Outland moved to Asheville NE to manage Blue Spiral 1, a gallery that specializes in Southern fine art and craft. After managing the gallery for 12 years, she left to establish her own arts consulting service, and, as an arts aministrator for the past 26 years [as of 2009], she has worked as an editor, grants panelist, presenter, juror, and curator for numerous projects and events. Outland reviewed 332 entries, selecting 110 pieces by 79 artists. "Best of 2008" Juror - Brion Clinkingbeard, Deputy Director and Chief Curator of the Kentucky Museum of Art and Craft, Louisville KY. He curates exhibitions for two galleries and coordinates all related educational activities and special events. He's implementing a permanent collection for the museum and has curated numerous exhibitions, including "Forging Ahead: Contemporary American Blacksmiths," "The Glass Vessel," and "Asian-American Ceramics." He has published articles on a variety of fine-craft-related topics, such as contemporary turned objects, studio glass, and Native American craft traditions in a contemporary world. Clinkingbeard reviewed 328 entries by nearly 150 artists. Selected for the "Best of 2008" were 111 pieces by 89 artists. Ohio Statehouse Museum Shop - The Ohio Statehouse is one of America's finest examples of Greek Revival architecture and is one of the oldest working statehouses in the United States. Completed in 1861 after 22 years of construction and restored to its original grandeur in 1996, the Statehouse is filled with priceless historic art, including a marble bust of Abraham Lincoln, the only one the President posed for during his lifetime. During the Civil War, the Statehouse grounds frequently housed encampments of Union soldiers. Nestled in the heart of this historic and stately capitol, the Statehouse Museum Shop has been sharing its unique Ohio-themed gifts with customers since 1996. Decorative arts and functional items from the wood lathe. © 2014 Don Leman All rights reserved worldwide.